My 4 year old loves to play dolls. I could easily listen to her construct imaginary scenarios and act out settings all day. She especially loves to change all of Barbie’s outfits and re-enact the day’s events at preschool through the eyes of her various dolls. So when I presented her with the Barbie Saddle and Ride to “play with” (so mommy could review it) she was absolutely thrilled. She immediately began to act out an imaginary world where Barbie was a horse trainer and was preparing for a big race. The coolest thing about this toy is that it moves. By clipping Barbie’s gloved pink hand into her horse's mane and push the button on the top of her horse's brow, Barbie will lift herself up into the horse’s saddle on her back and the horse starts walking on its own! You can even groom the horse by brushing its mane. 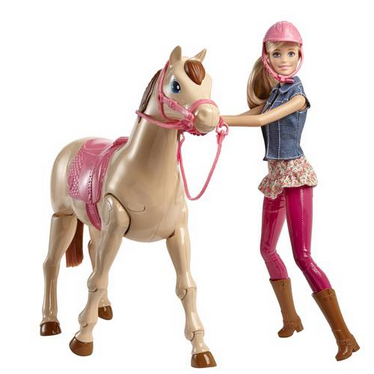 This toy includes Barbie wearing equestrian fashion and accessories and her horse with movement feature. The toy requires 3 AAA batteries (not included).